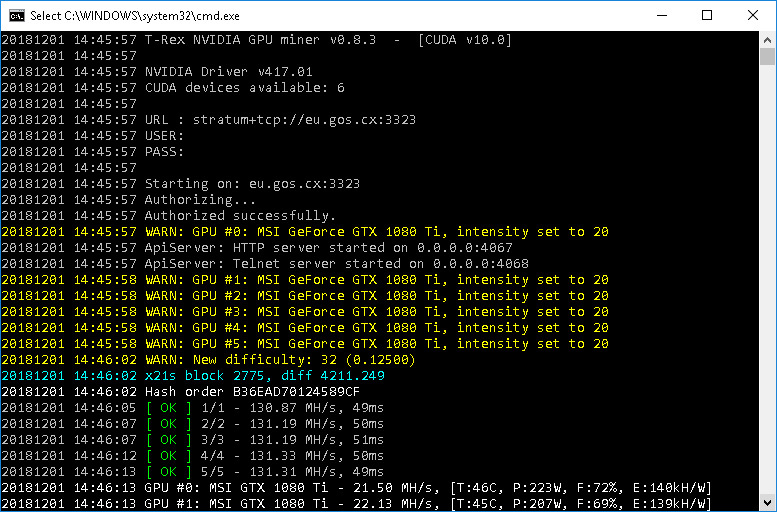 The latest T-Rex Nvidia GPU miner version 0.9.1 adds support for two new algorithms – X16RT (Veil) and SHA256Q (Pyrite) and comes with some minor performance improvements for x16r, bcd, x22i and other x16-like algorithms. There are also multiple web monitoring page improvements introduced, along with a Linux watchdog as a windows one has been available for a while already. Everyone currently mining Veil that uses the new X16RT algorithm might be interested in switching to T-Rex 0.9.1 as it seems to be even faster compared to the recently released CryptoDredge 0.16.0 miner that also added support for X16RT. 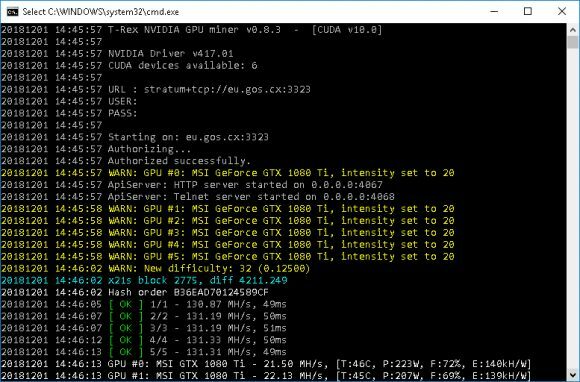 If you are looking for AMD GPU support for these two newly added algorithms in the T-Rex miner, namely X16RT and SHA256Q, then you might want to check the latest WildRig Multi miner. Do note that the T-Rex is a closed source miner with 1% development fee built-in. Also make sure you have a recent video driver installed (the latest for CUDA 10 support) as the binaries for both Linux and Windows are compiled for CUDA 9.1/9.2/10.0. 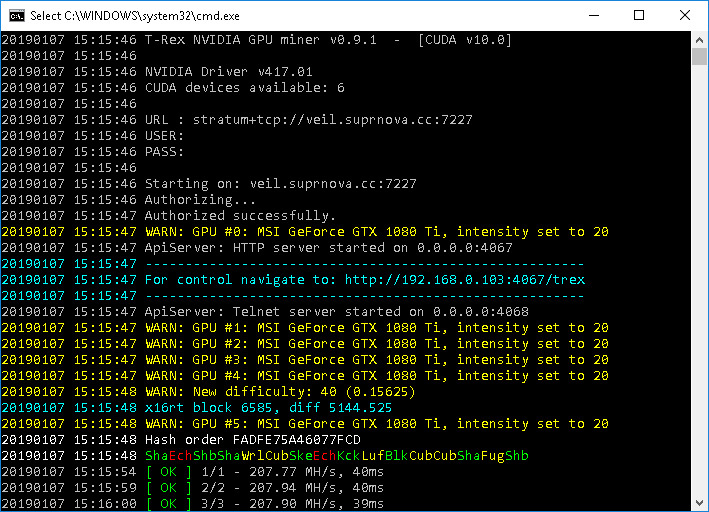 The T-Rex Nvidia GPU miner has been updated to version 0.8.9 bringing a number of improvements in terms of performance as well as support for some new algorithms since the last time we covered the miner. The newly added algorithms in the recent updates include astralhash, jeonghash, padihash, pawelhash that are being used used by GlobalToken. The performance improvements are focuses on X22i and the X16 family of algorithms in general (x16r, bcd, x17, x22i etc.) as well as skunkhash. Do note that the T-Rex is a closed source miner with 1% development fee built-in. Also make sure you have a recent video driver installed (the latest for CUDA 10 support) as the binaries for both Linux and Windows are compiled for CUDA 9.1/9.2/10.0. 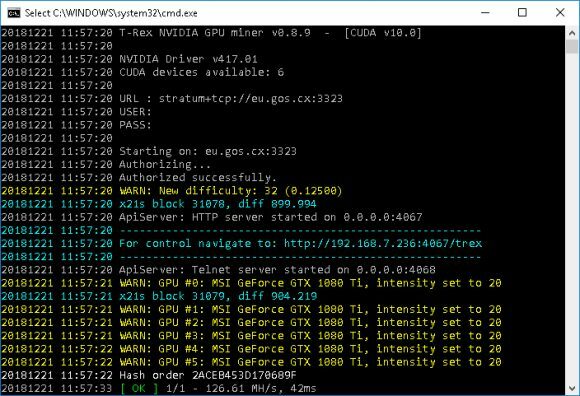 One more fast update to version 0.8.3 for the T-Rex Nvidia GPU miner that adds a new algorithm – X21S. The new X21S algorithm is used by the newly launched Ritocoin (RITO), a fork of Ravencoin (RVN) with modified mining algorithm that consists of 16 shuffled algorithms followed by 5 others. If you are interested you can check RITO out, it was just recently launched and is also mineable on AMD GPUs with the latest WildRig Multi miner. Do note that the T-Rex is a closed source miner with 1% development fee built-in. Also make sure you have a recent video driver installed (the latest for CUDA 10 support) as the binaries for both Linux and Windows are compiled for CUDA 9.1/9.2/10.0.